Organised and equipped as light infantry with rifles, not smoothbore muskets, riflemen have every right to see themselves as an elite. Chosen for initiative and intelligence, they fight without close supervision from their officers. Their uniforms set them apart in an age when soldiers dress like peacocks: they deliberately blend into the landscape so that they can stalk their prey. 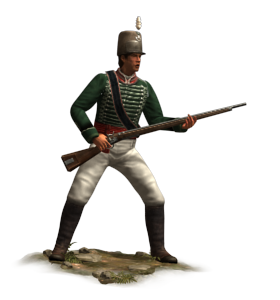 Historically, the most famous riflemen, the British Greenjackets, carried infantry rifles designed by Ezekiel Baker. This muzzle-loading flintlock used a small ball from a tightly rifled barrel to give superb accuracy. There are accounts of riflemen holding targets for each other at hundreds of paces! It was a slow business to load the piece properly, as high-quality powder was carefully measured out and the bullet wrapped in a leather patch then tapped down the barrel to engage with the grooves. All of this could take a minute or more to do properly, but the resulting shot was deadly over astonishing ranges. Baker even carefully supplied a long “sword bayonet” so that the overall length of his rifle plus bayonet matched that of a line infantryman’s bayonet-tipped musket.